Question: What kind of crab do you use in a crab salad recipe? Answer: I use imitation crab meat, sometimes referred to as krab or krab meat. Don’t think that even though it isn’t actual crab meat that this isn’t still actual seafood. This is actually why many people refer to the salad as Seafood Salad. Imitation Crab Salad (krab) is actually made with Surimi, a whitefish that is ground them binded with a starch to resemble a crab leg. Huffington Post wrote a great post about what exactly imitation crab (krab) is. I will say, nutritionally you’re better served purchasing actual crab meat, but for the purposes of a classic seafood salad, this is the ingredient you will find when you go to your grocer’s seafood counter. 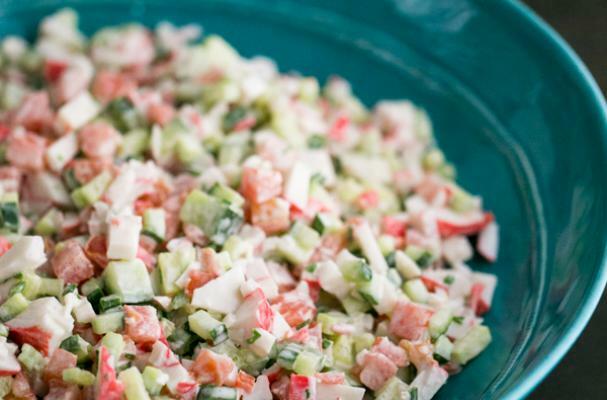 If you had crab salad as a kid this will take you back to those memories. I do highly recommend the crab salad sandwich though, it is delicious!